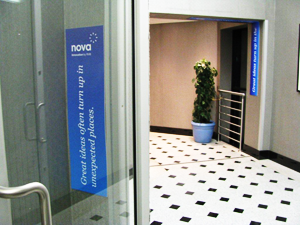 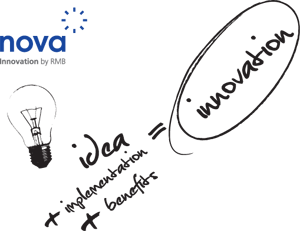 One Part Scissors recently completed an internal launch for Rand Merchant Bank called Nova Innovation. 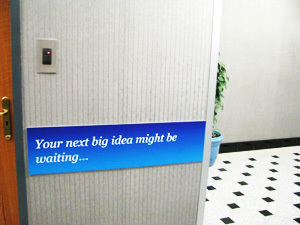 The project was done in collaboration with Michael Phillip. 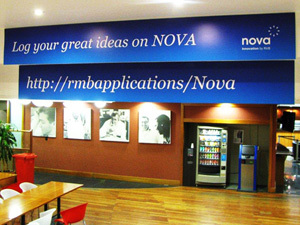 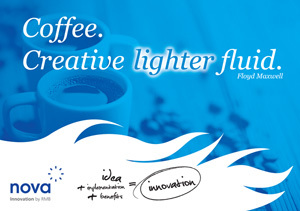 RMB Nova Innovation is an internal mechanism designed to encourage innovative ideas. 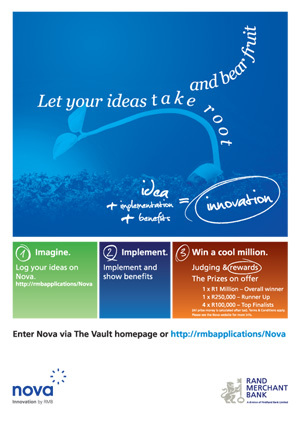 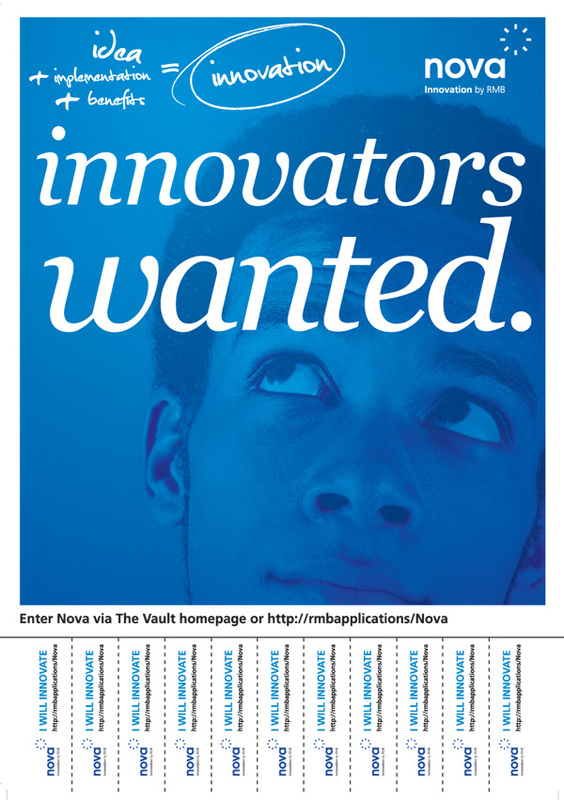 Any RMB employee who has an idea that can benefit the bank can submit their idea to the Nova intranet site. They must illustrate benefits and show how they plan to implement their idea, and their managers and peers will vote on the ideas. At the end of the year, the Innovations with the highest votes win substantial cash prizes. 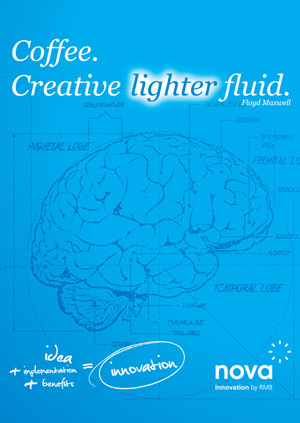 The awareness and educational launch campaign made use of innovative channels to further underscore the message of Innovation. 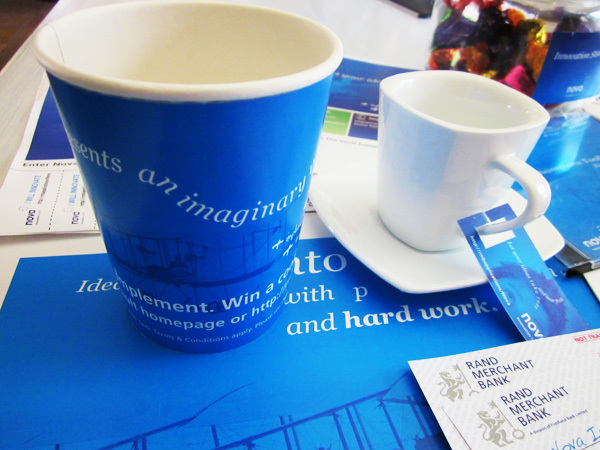 The Tea Ladies were 'branded' with t-shirts, branded coffee cup tags and coffee cup collars and posters on their trolleys. 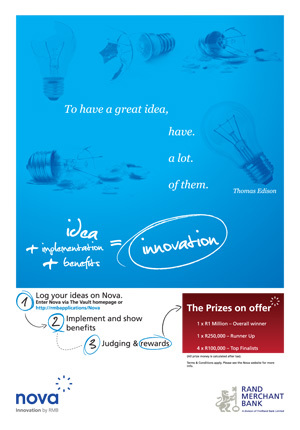 Trolley Posters Posters were modeled on the usual 'for sale' type flyers that can be found on notice boards near water coolers, with the message "Innovators wanted", complete with tear-off "I will innovate" tags that have the website address on them. 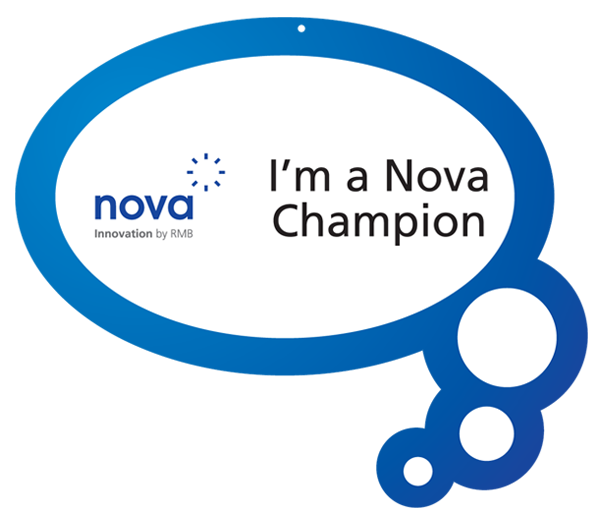 Notice Board Flyers The Nova project is structured to have 'Champions' that can promote the project to their colleagues within their departments and business units. 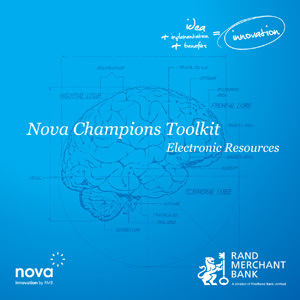 These Nova Champions were equipped with a Champions Toolkit that contains resources to assist them in promoting Nova. 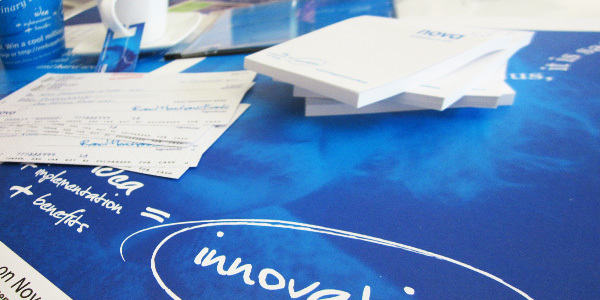 This includes branded post-it notes, whiteboard stickers with innovation messages, desk-drop flyers and posters, and digital resources such as email invitations and powerpoint templates. 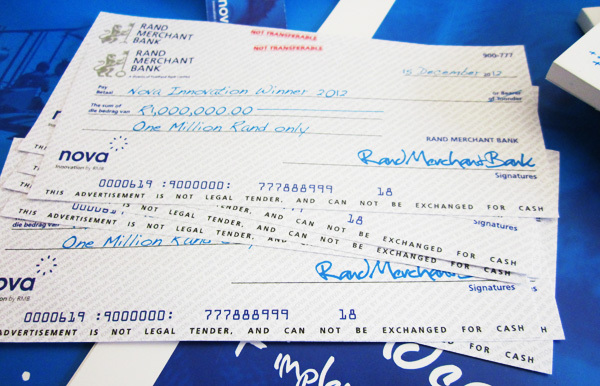 On launch day, all RMB employees found a promotional 'cheque' to promote the project - a tactile illustration of the prize on offer. 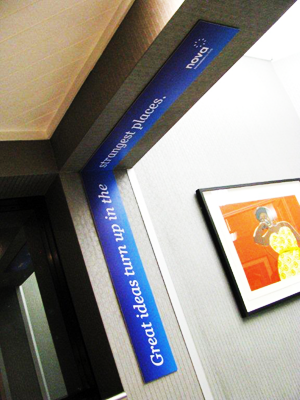 Lastly, wall mounted decals were places in interesting and unusual locations to spark the imagination and draw attention. 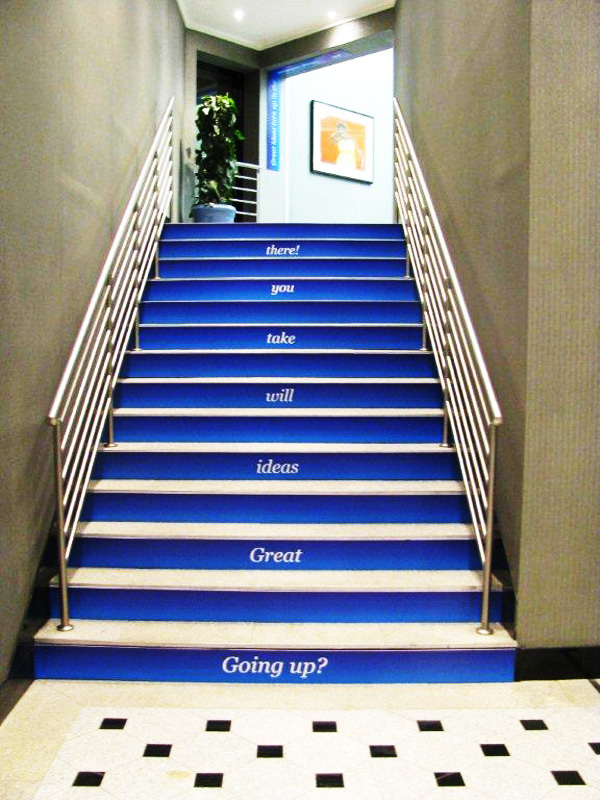 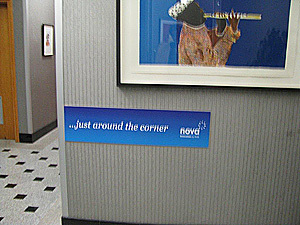 Wall decals were placed in unusual locations to draw the attention of people who walk these halls on a daily basis. 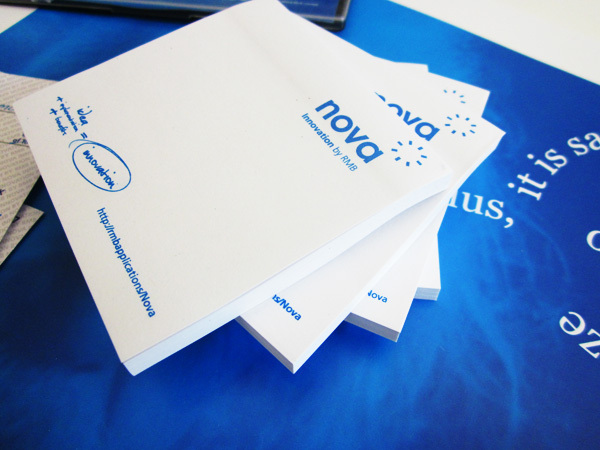 Other elements of the Nova launch campaign include a comic book, featuring a Nova Superhero that will illustrate the process to the employees of RMB. 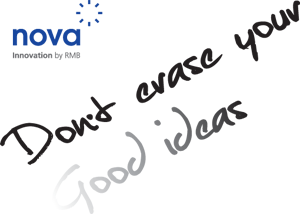 The comic book is due to be released in the next 2 – 3 weeks.